The eagle-eyed amongst you will have spotted that I have bid for and won two copies of the same jigsaw. 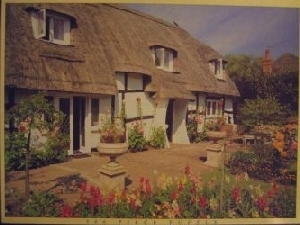 This is because they are both of our home for the last twelve years Avon Cottage. To have a jigsaw of your own home, how cool is that! The second one I gave to May as a present. Not only as a souvenir and memento but she also does jigsaws. 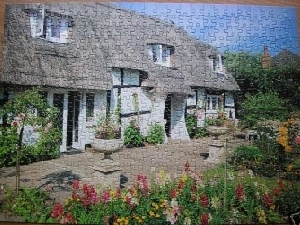 Mind you Fran next door at "Thatched Eaves" is the subject of a 1000 piece jigsaw entitled "Cottage, Ibsley" that comes up on eBay about once a month. She must have a four foot high stack of them in her living room. How amazing is that! It must reiterate to you how special your home is. As I've said before, it is absolutely lovely! !